Tom Dusseldorp is the first to admit not every marketer would want to be in his job. As general manager of marketing and innovation for Australian specialty and allergen-free food manufacturer, Freedom Foods, he holds a strategic and significant role in a business experiencing rapid, fast-paced, international growth. According to its most recent financials, Freedom Foods chalked up 86 per cent net sales growth across its 30-strong product range in FY2016, a figure that doesn’t just cover Australia but also increasingly North America and China. In addition, operating EDBITA increased 41 per cent year-on-year to $21.5 million. Freedom Foods also commands a significant presence in the health food aisles of Australia’s leading supermarket chains, and provides services for a range other food producers through its growing manufacturing plants in NSW and Victoria. But with great opportunity comes great responsibility. Dusseldorp is tasked with fuelling further growth through new product lines and brand expansion, and therefore has a direct commercial accountability and transparency some marketers still lack. This also requires him to build the business case for a marketing and then prove it. On the flip side, Freedom’s rapid growth and entrepreneurial culture ensures Dusseldorp holds a place among the country’s strategic marketing leaders. “I’ve worked in businesses where there has been pressure on margins, where the first function out is marketing because it’s the discretionary spend in P&L. That can be limiting for a team of dynamic marketers,” he says. He points out one of the key pillars at Freedom as an organisation is measuring delivery. Dusseldorp earned his marketing stripes building brands in the food and drinks categories. He started his career in agency land, working for a number of agencies before reaching senior account management at Publicis Mojo. He then jumped client side with Pernod Ricard, holding brand roles across the RTD and spirits portfolios, before going global to run the Chivas Prestige range in London. Returning to Australia five years ago, Dusseldorp looked after champagne and spirits categories locally before deciding to seek out a new challenge. He was attracted to Freedom Foods because of its growth aspirations as well as the chance to build brands. “It’s hard to find a company that’s firstly in growth, but also that needs you to be a more entrepreneurial marketer, who is willing to take some risks but gives you autonomy in return,” he says. 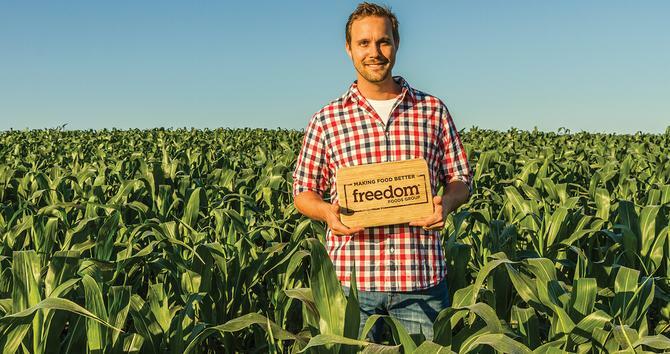 Dusseldorp joined Freedom initially as marketing lead for the beverage business, tasked with establishing a strategy that could deliver ambitious growth in the non-dairy and dairy beverage category. This led to the launch last year of Milklab, specifically for the barista market, available in dairy and innovative non-dairy varieties including almond, soy and coconut milk. Dusseldorp says a key to the brand’s success was winning over external influencers and own the barista market. Milklab subsequently won the New Product category at the 2015 Fine Foods Australia Awards. The Milkbar launch set the new marketing bar internally, and led to Dusseldorp’s promotion to CMO across the group seven months ago, overseeing the wider cereal and snacking divisions. “Our success helped convince the Freedom Foods management team as to what a functioning marketing team can bring in terms of adding value and opportunity to the business. It was a big turning point for us,” he says.